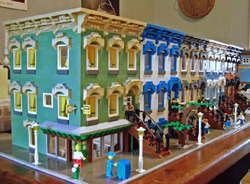 A computer scientist named William Leue has built a very cool model of row houses on Elm Street in Albany -- out of Legos LEGO. There are more -- and bigger -- pictures posted at the site linked above. In a comment there, he says it took him a few months to build the scene. I must say, that is pretty awesome! The plural of LEGO is LEGO blocks! Never "legos"
That is amazing! I've been wanting to buy some of LEGO's more urban sets for a while know but Mr. Leue has totally blown those away. Good job! Bill has done a fascinating and great job. I can see this circulating nationally around historic preservation circles. Has anyone sent it to the Old House Journal yet? I forwarded this to a friend in California who used to live on that block of Elm Street. Below is what she said, "can't believe it - amazing - THANKS FOR SENDING - this was darling!"